How often have you received a ROUND card from someone? They are so special and unique, and super fun to make. 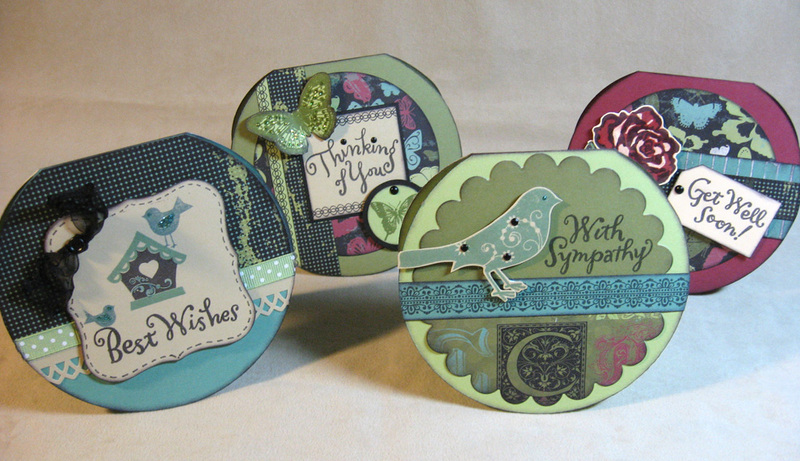 Thanks to my Wishes book, I was able to whip up four round cards in an afternoon. What is Wishes you ask? It's one of Jeanette Lynton's hardcover "card confidence program" books. Founder and CEO of Close To My Heart, Jeanette has now designed five books in all. 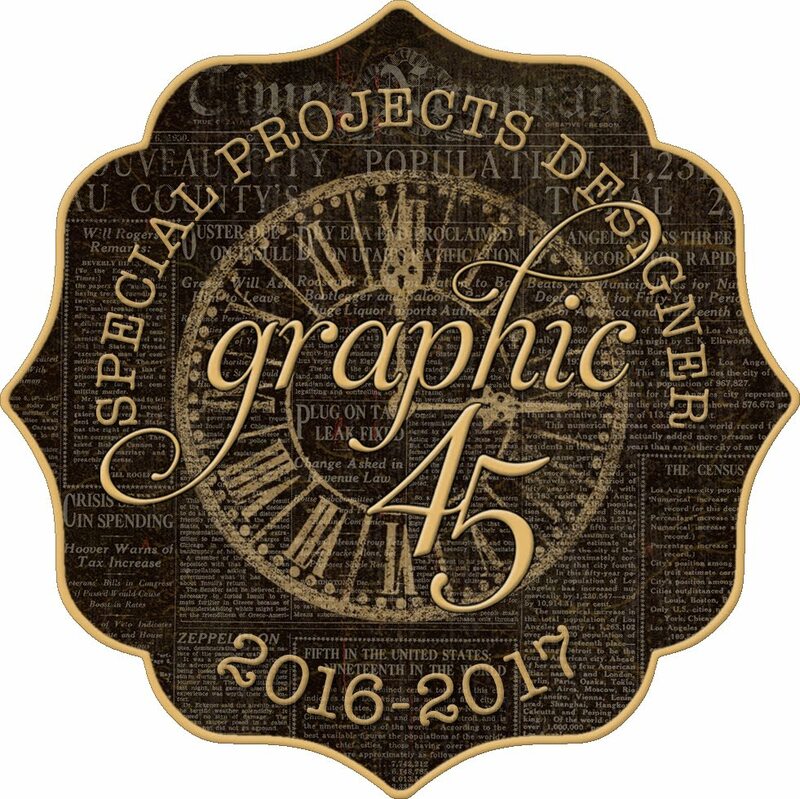 Cherish, Imagine and Reflections for scrapbooking, and Originals and Wishes for cardmaking. Wishes is the newest in the series and provides beautiful artwork examples of simple and fun cards to make, plus a blueprint of each card and cutting directions for assembly. I like how the book takes one blueprint of a card and shows us at least three different examples throughout using various combinations of stamps and paper to make three totally different looks. 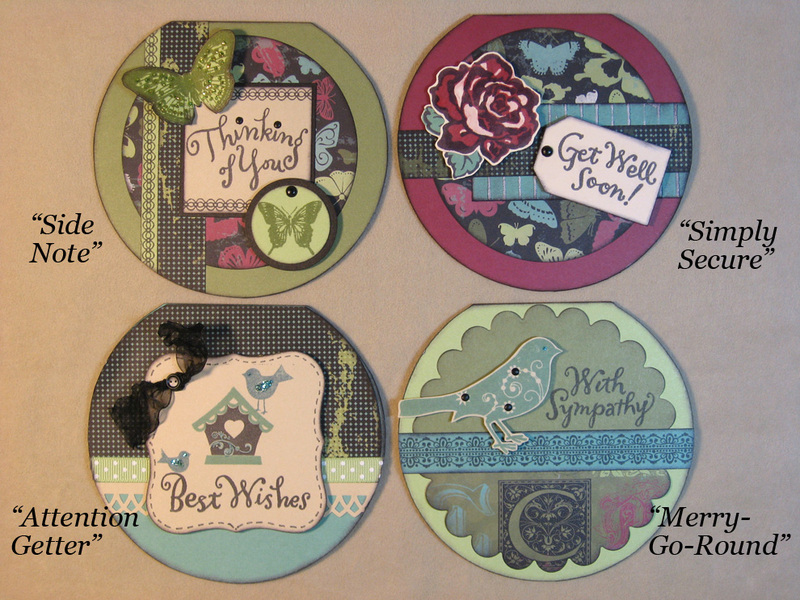 Here are my four cards, and below I show the name of each pattern I used from Wishes. 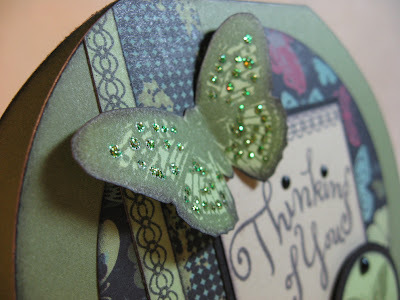 The papers are from the new Wings paper pack and I used many different stamps from the new Spring/Summer Idea Book. While I don't have time to list everything right now, if you have any questions just leave me a comment and I'll get back to you. Thanks for inspiring!! I have a lot of trouble with the round cards - they never seem to look right for me (I'm more of a straight lines kind of girl!) But these are fantastic!!! LOVE them! all of them are amazing!!!! Gorgeous cards!! Thanks for sharing. I'll have to try some round ones.